We all remember the day we turned 21. It’s a turning point in one’s life. On that momentous day we could legally do things that up until then were prohibited – most notably walking into a drinking establishment and ordering an alcoholic beverage. Our range of freedoms expanded and we truly became adults in every sense of the word. That’s why Incredible Technologies is so excited about its flagship product – Golden Tee Golf – turning 21. Up until now it was simply the most successful pay-for-play video game in amusement history. Billions of dollars have flowed through over a hundred thousand machines. Players have won over 25 million dollars in online tournaments and contests. The industry has recognized the game by awarding it every conceivable honor. What more can one game accomplish? No matter what fabulous bells and whistles the geniuses at IT add to the game every year, everything takes a back seat to the new courses. After all the new courses are the backbone of the game. According to Brian Jandula, Golden Tee project manager and senior software engineer, no matter how cool some new feature is the new courses will make or break an update. Seventy kilometers north of Beijing is Mutianyu, the site of The Great Wall of China. Soaring mountains, unmistakable sand traps, demanding greens, and the legendary Great Wall make this is a Golden Tee journey players will never forget. Be accurate and stay clear of the Terracotta Warriors. Deep in the canyons of Navajo, Arizona is Monument Valley Golf Course. Roam around, over, and through eighteen holes of creatively positioned rocks, boulders and mesas, all the while taking in the breathtaking vistas and majestic tableaus of the West. While water here is rare, what few puddles there are can have a devasting affect on your score. The vast South Pacific is home to Taverea, Tahiti – the spot for the most exotic golf course in Golden Tee history. While Tahiti Cove is without question beautiful, its treasures are more appealing to the eye than the scorecard. The return of molten lava – and the sizzling sound it makes when a wayward shot finds its fiery embrace – is more than just a hazard to avoid. Be careful or you’ll get burned! Tucked away in the peaceful hills of Tuscany, Italy is Bella Toscana Golf Course. A wide variety of terrain, highlighted by the return of thick and muddy mire, provides separate and unique challenges on each hole. The Panzano vineyards are the perfect setting for a round of golf and a glass of chianti. The quaint town of Valdosta, Georgia is the last stop before the Florida state line and home to a Golden Tee gem. Southern Oaks Golf Club has the feel of a more traditional southern gentleman’s golf course. 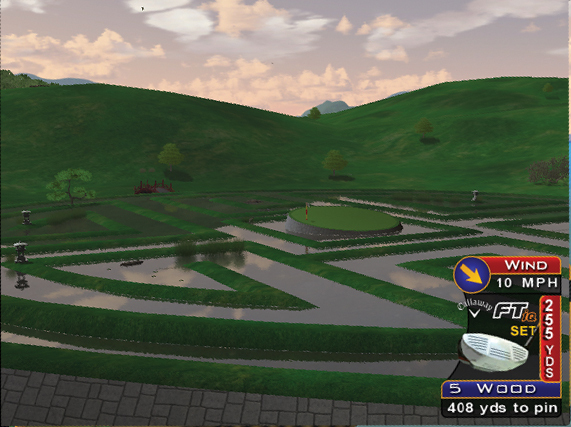 Rich in dense trees and lots of green, this shot maker’s course will test even the most skilled trackballers. Skilled players have come to expect bigger and better challenges every year and more ways to win – and 2010 does not disappoint. Besides Golden Tee standards such as 18-hole $1.00 prize play, Closest-to-the-Pin LIVE and Hole-n-Win, players looking for a more substantial return on their investment will love 9-hole $2.00 prize play. Casual players are the life blood of Golden Tee. And though they may not be as vocal as the online community of skilled players, they represent the largest segment of Golden Tee players. Many players enjoy Golden Tee but cringe at the highly competitive nature of the national contests. For them the perfect Golden Tee round of golf is a game played for fun – with no pressure to perform at a high level. Jandula’s team isolated the one feature of online live play that does appeal to this market segment – statistics. Players want to know how many holes-in-one they’ve shot. They want to know their average score and their handicap. Now this information, and all their stats, is available to them at goldentee.com when they select Stats Play. This entirely new mode of play brings a casual sensibility to online play. As the amusement industry leaders in utilizing social media to expand its brands and connect with players when they aren’t in locations playing its games, Incredible Technologies adds another cool option to Golden Tee LIVE 2010 – GT/Facebook Connect. Golden Tee’s dynamic duo of Jim Nantz and Peter Jacobsen return with all-new commentary that will provide a fresh take on one of the most important aspects of the game. Both Jim and Peter recorded more than 5,000 new lines that will be debuting this fall. Most are good natured jabs, but look out for some biting remarks when a shot goes off course! Wallop top-of-the-line Callaway drivers and irons. Stroke long putts with deadly accuracy with Odyssey putters. Choose from Top-Flite’s incredible array of long and soft balls. Golden Tee is a virtual driving range for the greatest golf equipment and balls in the world – and players love to see how all the new equipment performs each year. A gorilla mask? An arrow through the head? A baby blue tuxedo? This is just scratching the surface of an entire selection of new clothing options and other zany items that players can use to outfit their on-screen character. The more outrageous, the more the players love it! An entirely new soundtrack for 2010 awaits players who prefer a little cool indie music with their Golden Tee experience. The Hit List is a unique blending of music and gaming. And it’s back for 2010. Go Ahead – Be a Showoff! It’s been said before but it begs repeating. We live in a hi-def world. And now’s the time to get your head out of your cabinet and upgrade your route to Golden Tee LIVE Showpieces. Players have been heard to exclaim that playing Golden Tee on a Showpiece cabinet is a “religious experience.” That experience translates to more play and bigger cashboxes. When you order your 2010 update make sure you consider a Showpiece cabinet too. Golden Tee LIVE 2010 is the culmination of not only a year of hard work by the talented teams at IT, it’s the result of a continuous evolutionary process that began in 1989. As the game enters it’s 21st year, everyone at Incredible Technologies wants to thank operators, distributors, locations and players for their trust, dedication, loyalty and passion, but most of all we want to thank you for your business over the years. We are truly thankful for every machine and update that’s been purchased and every game that’s been played. For more information on Golden Tee LIVE 2010 visit the official website at www.goldentee.com, and check out the GT 2010 music video at http://youtube.com/goldenteegolf. Wow, it’s interesting to know that even golden tee has its courses these days. Good luck on this change.